Hey there, have you ever been in that awkward situation when you send a message to someone whom it wasn’t intended for, and you feel so bad about it, or ever sent an inappropriate message to someone and wish you could take it back, well you can with the help of my How To Unsend Messages On Facebook Messenger article. Facebook and Facebook messenger just got updated, and they now have this feature working perfectly. Without stress, you can unsend a message that you sent to someone that you didn’t want to receive such a message and the person won’t have a clue. Facebook Messenger is a messaging app, a platform that was created for Facebook as a Facebook chat platform, with this platform you can send and receive millions of messages to your friends on Facebook and even share photos and videos of your day and other activities, you just need to know How To Unsend Messages On Facebook Messenger. So, when you get to that point where you are in a heated conversation with a friend and you just sent an awkward or an inappropriate message to him/her, you can quickly use the steps on How To Unsend Messages On Facebook Messenger that I’m going to put down below to quickly unsend or remove the message before your friend gets a hold of it from his/her end. Now, before you talk about How To Unsend Messages On Facebook Messenger, you need to have the Facebook Messenger app on your Android device or IOS, obviously, you won’t click on this article if you didn’t have an Android device that can download a Facebook messenger app. 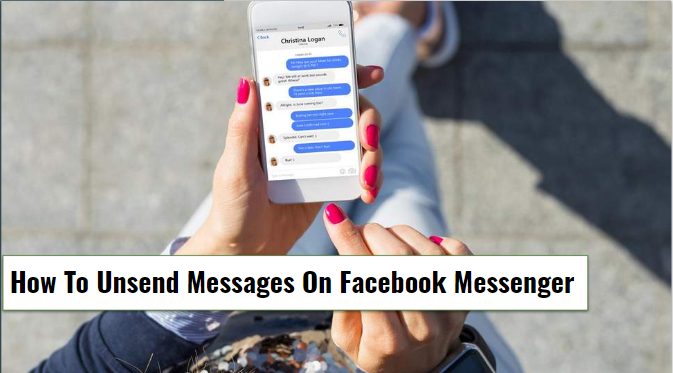 The steps are very simple and straight forward, follow carefully and successfully get the hang of it and know How To Unsend Messages On Facebook Messenger without stress. Step 1: First have the updated version of Facebook messenger, if you do already then don’t bother with this step, but if you haven’t, you can access Google play store and search for the app and updated it from there. Step 2: Now, in the chat room of the Facebook messenger, tap and hold on the message you want to remove, an options menu will pop out from the bottom of your screen. Steps 3: On the options menu, click on ‘Remove’ and then two options will pop up, ‘Remove For Everyone’ and ‘Remove For You’. Step 4: Click on ‘Remove For Everyone’ and the message will be gone for good, for both yourself and the recipient. Step 5: Now, if you are looking at only removing a message for yourself, then you can click on the ‘Remove For You’ option and the message will be deleted for you only. Step 6: For every message, you remove, a notification will automatically be sent in place of the message, notifying the person that you just removed a message. Step 7: Finally, a piece of very important information is that For every message you send in the chat room, be it awkward or not, you have 10 minutes to either remove the message or not to after 10 minutes the message will have no other choice but to remain on your chat forever. That is basically all you need to know on How To Unsend Messages On Facebook Messenger, very easy and simple to understand, it’s quite quick and easy to go through with, and you can get back to your chat in no time. So, I’m excited that Facebook has finally come to terms with the fact that it’s not a maybe, and have given all it’s users the ample ability to unsend and remove messages from the Facebook messenger. All thanks to the none other than the C.E.O himself Mark Zuckerberg for discovering this option and making things better and more convenient for all the users of Facebook Messenger. We all know Mark Zuckerberg is a genius, that is why we are enjoying the wonders of Facebook. So, with that been said I want to say thanks, for your time and patience, till next time, but for now, I got to say bye for now. previous How To Change Twitter Password | Twitter Password Reset | Working!